In a rematch from Friday night’s game, the WMBL division leaders put on another great show. Saturday night it was a pitching duel as both starting pitcher stole the spotlight in Lethbridge’s 2-1 victory. Regina’s Dalton England threw six complete innings giving up seven hits and two runs. He also struck out three Bull batters. Lefty Kal Daniels took over and was lights out throwing two scoreless innings. For Lethbridge, Oakville, MB product Brady Moxham made his second start of the season. Moxham was dominating over his seven innings of work. The South Dakota State right hander allowed four hits and two walks while picking up seven strikeouts. Wesley Moore picked up a scoreless eighth inning. Closer Chris Stodolka came on and earned his league leading fourth save of the year. 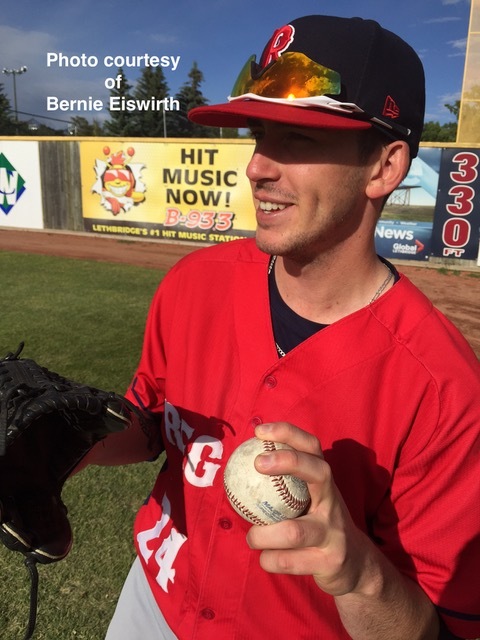 Another great crowd of 625 in Lethbridge at Spitz Stadium watched Lethbridge score the game’s first run in the third inning. Regina tied the contest up in their half of the six inning before Nolan Handley put the Bulls back on top for good with his homer in the bottom of the sixth. Next up for the Red Sox is an afternoon contest in Brooks against the Bombers. With the loss the Red Sox are now 6-3 while the Bulls improve to 7-1.